My, it’s been a long time since I’ve played in the Crazy Wisdom Tea Room in Ann Arbor, but I’m excited to return on Friday, October 3rd from 8:30-10:30pm. 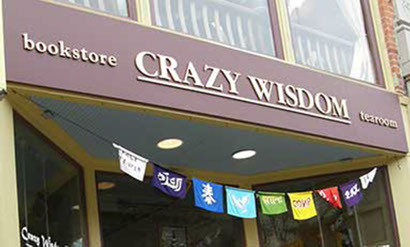 Crazy Wisdom is not only a great spot for inspiring live music, but also a perfect place to: Drink tea, browse for books, munch on yummies, get your palm read, hear great authors, expand your mind, tune your chakras, and of course stay stocked on incense. I’ll be promoting my new CD, Lost Treasures: Feet and Hands and Other Parts from the Re-discovered Remains of the Seeker, the Dreamer, the Joker, and the Kid, and I may even have a copy or two there with me. I promise to be prompt, and I’ll see you there.